The art chosen for this, our first full-color issue, is a series of tapestries sewn by Esther Nisenthal Krinitz, a survivor of the Holocaust in Poland. In 1977, at the age of 50, Esther began creating illustrative works of fabric art to tell her survival story, and to memorialize the family and friends she lost. Esther was a highly skilled needleworker and dressmaker but had no formal art training. 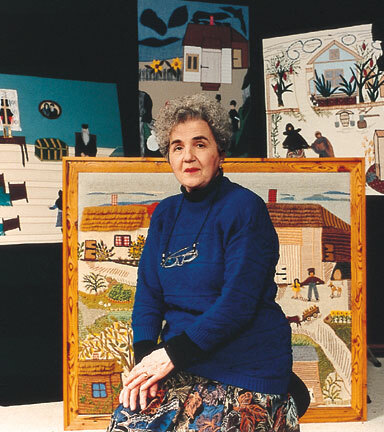 The 36 works she created until her death in 2002 are a combination of crewel, fabric, and appliqué. While the pictures are visually pleasing, a closer examination reveals the shocking incongruity between the pastoral surroundings and the violence, terror, and betrayal depicted. The story portrayed here begins in October 1942, when the Jews of the village of Mniszek were ordered to report to the train station for deportation. Esther determined not to go with her family but to escape with her 13-year-old sister, Mania. Her mother’s last words to her daughters were, “Goodbye, my children, maybe you will live.” The sisters ran away into the forest, assumed new names, and evaded the Gestapo by posing as Catholic farm girls. They never saw their family again. The pieces reproduced in this issue tell only a part of Esther’s story. The entire collection of tapestries is currently installed at the American Visionary Art Museum in Baltimore, and there are plans to display them at the Jewish Heritage Museum in New York City. Esther’s work can be viewed online at www.artandremembrance.org. Art and Remembrance is a nonprofit founded by Esther’s daughters, Bernice Steinhardt and Helene McQuade, which aims to bring attention to her life and work, and to use the power of personal narrative in all art forms of to illuminate the effects of war, intolerance, and other social injustice. Esther Nisenthal Krinitz in her studio. Photograph by Sanford Blum. “We grew up with the stories of our mother’s courage and suffering as a child,” says Bernice. “Years later, after Esther began to turn her stories into a narrated series of fabric art pictures, we realized that art and story combined had enormous power.” In this journal devoted to the power of personal narrative, we’re honored to combine these pictures with the stories of our contributing writers. On April 17, Bernice Steinhardt and Helene McQuade appeared at an evening of discussion and music hosted by God’s Friends in association with San Francisco’s Congregation Sherith Israel and St. Gregory Nyssen Church. You can read an exclusive interview with Bernice and Helene in our online edition.